Construction learners from across the South West gathered at South Devon College on Tuesday 12th April. 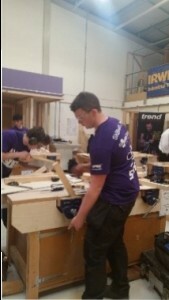 They competed in the South West Regional Heat of Skillbuild 2016, a national construction competition delivered by the Skillbuild – Construction Industry Training Board (CITB). It has been running for over 45 years touring the country looking for the best in regional talent from the construction industry. 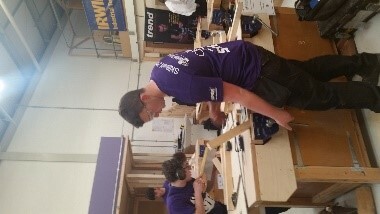 Trainees were put through their paces during the day showcasing the very best skills in all disciplines; as well as have a go activities, school/ college visits, promoting construction careers; and trade stands from Festool, Dewalt and Stihl to name a few. Over 100 competitors took part coming from 16 colleges and independent providers from Swindon to Cornwall. Trades including Carpentry, Cabinet Making, Brickwork, Plastering, Joinery and Painting and Decorating were all represented. All placed competitors if scoring high enough are given the opportunity to participate in the National Finals which will be held at The Skills Show, Birmingham NEC in November 2016. Liam Martin receiving his first place prize from TV celebrity Tommy Walsh and South Devon College Principal Stephen Criddle. 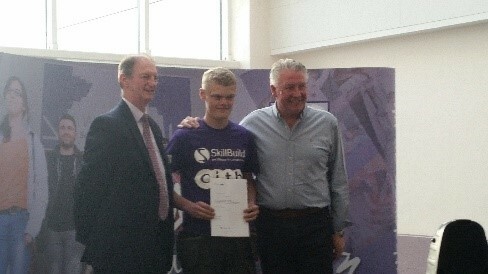 Liam Martin achieved First place (Gold Medallion); and hopefully, with the coaching/ training received by Andrew Pengelly and Didac Ltd, he will be placed high enough to take part in the World Skills UK Skills Show Final. This is the official route to possibly be selected for Squad and Team UK Selection. Jon Gibson, Managing Director would like to congratulate all learners that took part and hope they have learnt from the experience. Well done all.